Like humans, a dog's normal body temperature should stay within a certain range. A temperature too low or too high could indicate something serious and you should take your dog to a veterinarian. Dog’s normal body temperature ranges between 99.5° to 102.5°F. It would be a good idea to learn how to take your dog's temperature when he's not sick so that you'll both get the hang of it before you have to do it in an emergency situation or when the dog isn't feeling well. 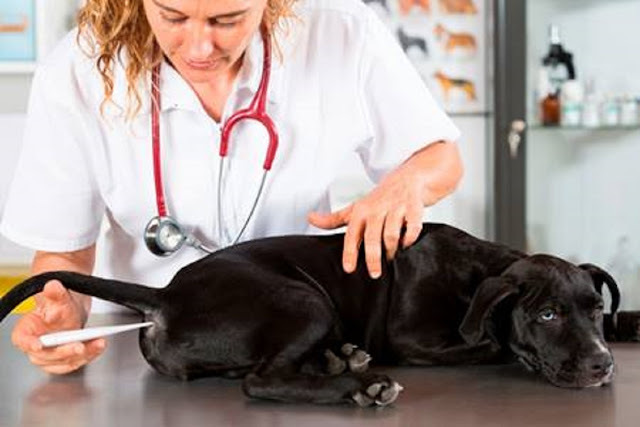 In addition, by learning how to properly take your dog's temperature, you can give your veterinarian more complete information that will help him or her diagnose your pet. Your pet's temperature should be anywhere between 100.5 and 102.5 degrees Fahrenheit when taken rectally. You can also take your pet's temperature through its ear. The eardrum is actually a good place to acquire body temperature because it takes a measurement of the brain blood temperature. With the help of an ear thermometer, the infrared heat waves emitted from the area are measured. When taking your pet's temperature with an ear thermometer, be certain to insert the thermometer deep into the ear canal. It is also a good idea to use an ear thermometer that was specifically made for pets, as these thermometers have longer arms that make it possible to place the probe deep inside the ear. It is a good idea to take both a rectal temperature and an ear temperature the first few times you uses an ear thermometer. This way, you can compare the temperatures and see how closely the readings compare. A normal ear temperature is anywhere between 100 and 103 degrees Fahrenheit. Any time a pet's temperature falls below 99 degrees or rises above 104 degrees Fahrenheit, you should contact your veterinarian. If your dog has a high temperature, it is a sign that it is suffering from an infection or an illness related to heat. On the other hand, a low temperature can indicate shock or other serious illness. · General behavior change, particularly acting "cranky"
When you contact your veterinarian, he or she will likely run some blood tests in order to better pinpoint the problem and provide your pet with the proper treatment.